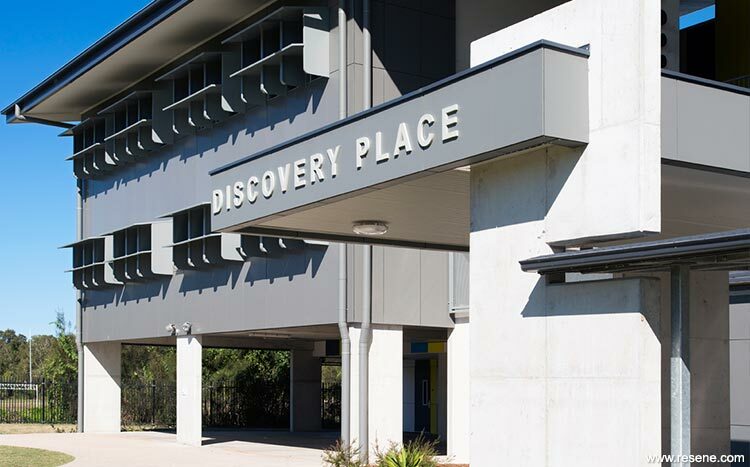 COBiE Group were engaged as Principal Consultants to deliver a multi-level General Learning Block on an existing site as part of the Queensland Government's Flying Start Program. Enrolments for this school are significant and the new building was to be three levels of construction housing general learning areas, project development, collaborative spaces, flexible learning areas, staff workrooms and amenities. The atrium is the hero of this building, housing a project development area, which is a functional learning space for staff and students, as well as creating an uplifting and central gathering point for the school community. Natural light pours into the upper and middle level through the atrium and in to the circulation spaces which are accentuated with the use of bold colours. 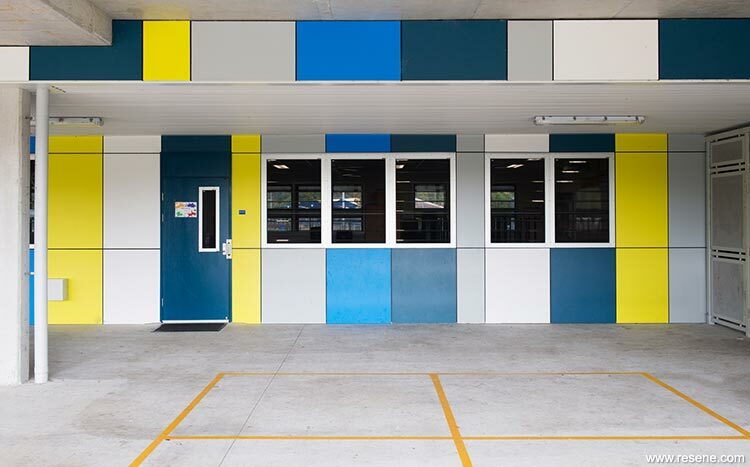 This strong use of colour contradicts the solid protective facade of the building, bringing the focus to providing inspirational internal spaces for the students. 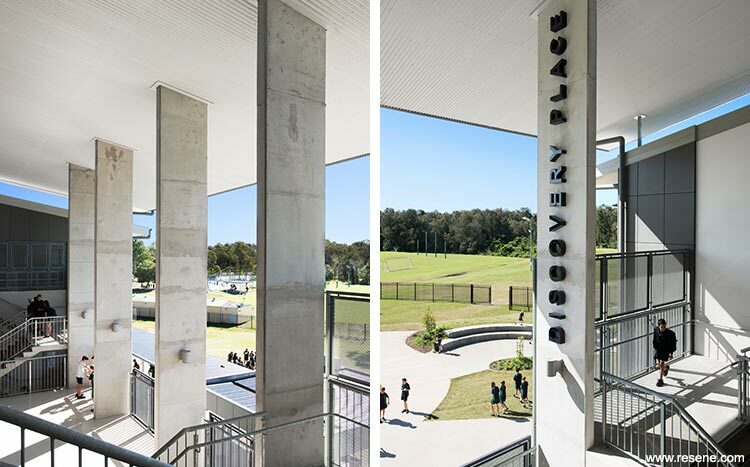 The school has a proud sporting agenda and this was maximised as the atrium opens out to the school oval. A distinctive entry node has been created for the building with an oversized path to create a sense of connection to the existing school. Part of the brief from the school was to provide a building that protects and nurtures the new young students while still providing an inspirational and playful environment. This was the guiding influence in selecting a dark and neutral external colour which contrasts with the bright and playful corridor colours. The breezeway is finished in Resene Lumbersider low sheen waterborne paint in a palette of Resene White Pointer, Resene Delta, Resene Endeavour and Resene Adobe Adobe. This contrasts against the neutral building facade in Resene Chicago and Resene Triple White Pointer and leads smoothly into the interior in Resene Lonely Sheen tinted to Resene White Pointer. The doors and entry structure are in Resene Nile Blue. 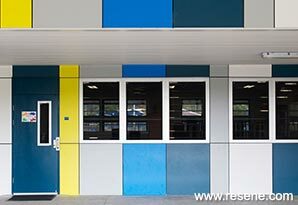 Resene was chosen because of its colour integrity in external applications as well as its extensive bright palette selection; a wide selection of bold and bright colours suitable for external applications were needed to accommodate the stripe pattern in the external corridors. Longevity and minimizing maintenance are critical factors when specifying for Education facilities.